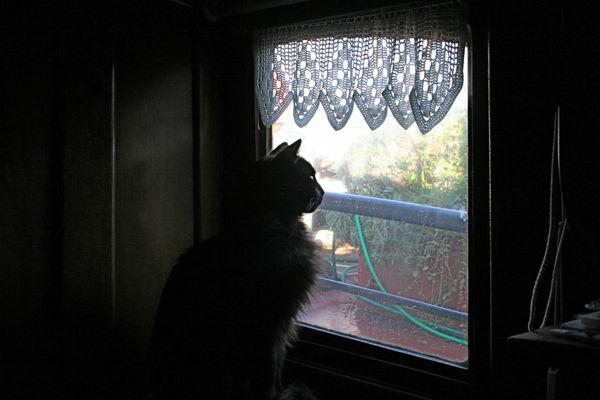 So it’s good that we’d planned ahead during the first cold snap at the end of November and installed some “ghetto double glazing” to those massive saloon windows. 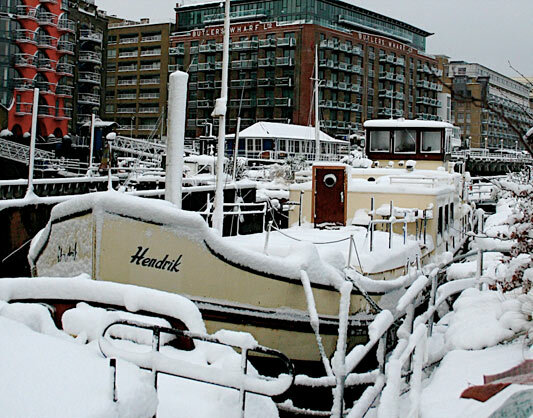 For anyone not familiar with Hendrik – she was operating as a summer-only hotel for canoeing holidays up until we bought her three years ago, so there’s scant insulation throughout and only single glazing on all the windows. The saloon is currently the last phase of our (approx 10 year) renovation plans, so the cost of any small improvements made now to the saloon will be divided over a fair number of winters. 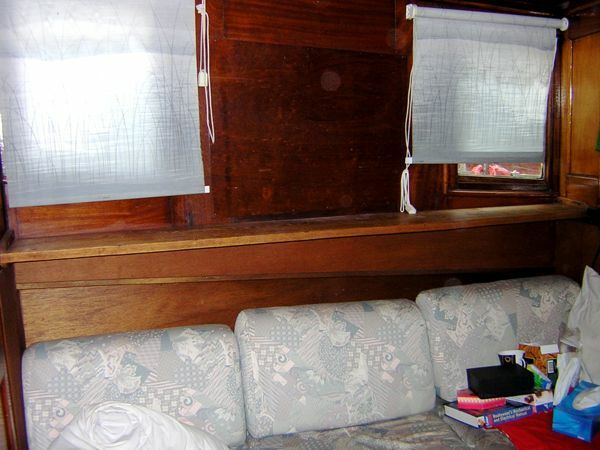 The small improvements on heat retention here came in the form of 3mm plexiglass sheets with foam weather stripping stuck around the edges, which were then screwed to the walls around the large saloon windows. 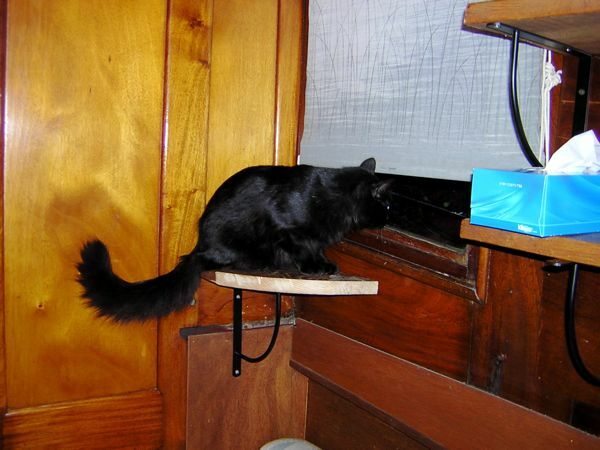 We’re not stupid – we know there’s no seal there so it’s not as if this is double-glazing, but at £50 a window (they’re 1m by 1.2m each! 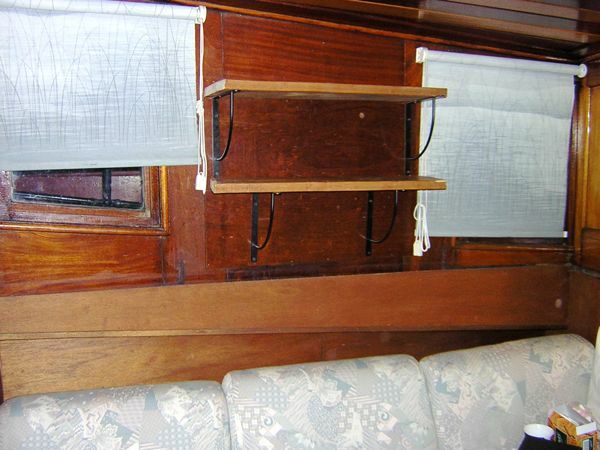 ), there is a noticeable difference of several degrees in the saloon with them installed, and it means we still get the light through and with no distortion to our view outside. There are tons of better window insulators out there, but none that would retain our light and view like this. And this also means we can just unscrew these in summer to regain the opening of those big windows (which give a beautiful breeze throughout when it’s hot outside!) with only a few tell-tale screw holes remaining. So now the big radiator in the saloon is struggling to keep the temperature at around 15-16C in there rather than 12-13C before the plexiglass was installed. That doesn’t sound like much, but it is the difference between being able to sit comfortably with a sweater in there, vs having to wear a coat and gloves and see your breath eating dinner. At least our bedroom, bathroom, and my sewing room are plenty cosy right now! Remember back in August when Nigel Slater came round for tea? Well, our episode is finally airing this week, as the last of the season! So if you’re in the UK (or Ireland, or some parts of France and The Netherlands), please tune in to BBC1 on Wednesday 22 December at 20:30 to watch us (In Scotland it’s slightly earlier, 19:05 on BBC2)! We’ll be a 10 minute segment in the middle of the 30min show, so you can see our beautiful moorings and boat in the summertime sunshine. Which is a bit nicer than our deck looks right now! An awful lot has been going on around Chez Hendrik in the past few weeks, but we’ve been terrible bloggers about actually reporting on it. 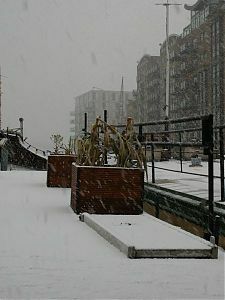 First up was the snow back on 2 February! 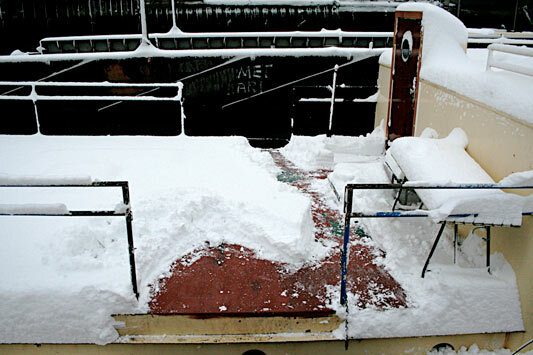 We woke up to a FULL FOOT of snow on deck! We’re not really prepared for such amounts here, so we had to break out our rambling boots and use our squeegee to clear a path to the door (to actually get the saloon door open, too). So the cold and wet have obviously slowed all our exterior work, so we’ve been pushing hard the past few weekends to finally finish up the Captain’s Cabin for rental as well as convert what’s now James’s temporary wardrobe (1 1/2 hotel rooms) into a temporary bedroom for us. I think we can safely say we’ve bought all the supplies now (save the worktop for the kitchenette) so what’s left is just putting it all together. 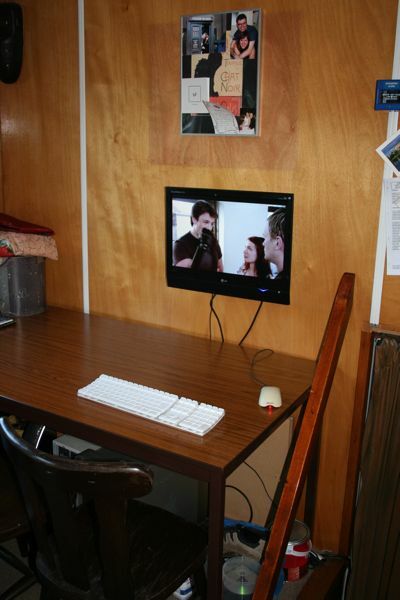 The other biggie is that we went out and bought new carpet (remnants) for the entire Captain’s Cabin, wheelhouse, and probably enough to make our temporary bedroom a bit cozier, too. 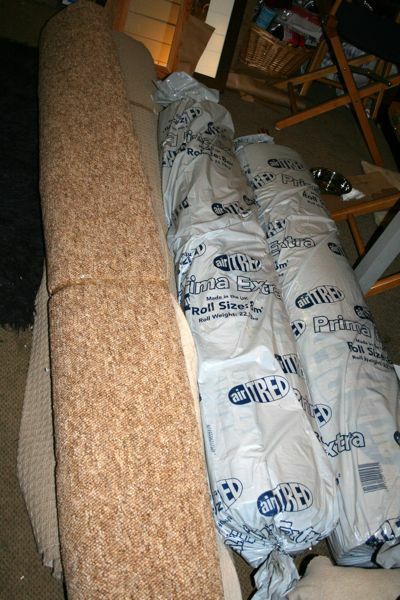 The carpets were cheap, but we went for the super-insulating, draft-proof underlay after having cold feet all winter, which wasn’t. But the more winters you live on a boat, the most you come to value good insulation, so we think it’s worth it. And myself? Well, I’ve been concentrating mostly on getting the old wardrobe into working order as a bedroom, so I’ve been hacking away at old radiator and cold water pipes. The latter aren’t too bad, but the old radiator pipes are gross – lots of viscous black stuff pouring out of them despite draining the system and there never being any radiators down in the hotel rooms anyway (arrrgh)! Automatic for the people (and cat)! Not only do we have a warm saloon, but now we have an automatic and thermostat controlled warm saloon! We always had a thermostat controller from when Nikolaj installed the boiler, but the electrical cable was only long enough to reach a few feet into the galley, where it’s WAY too cold to act as a regulator for the saloon (really, it’s cold enough for our olive oil to congeal down there). We were just turning the radiator on manually when we went over to the saloon, but it takes a while to warm up so it wasn’t really ideal. …and hurrah! 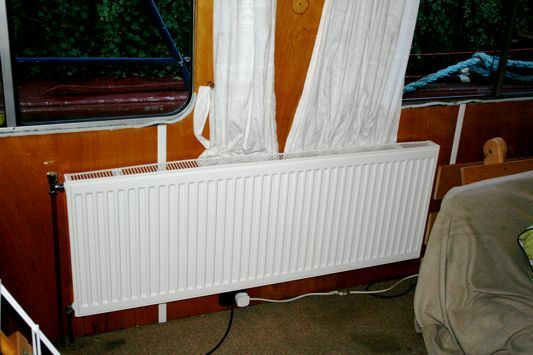 We now have a saloon radiator that comes on in the morning and again in the evening, keeping the temperature about 5 degrees (regardless of time) and shuts off if it reaches 15 degrees (we optimistically set it for 20 degrees then realised it never actually reaches that, what with the huge, single glazed windows, and 15 was comfortable enough). It’s such a luxury to eat breakfast without seeing my breath! We’ve been pretty good over the last few weekends about getting small but important tasks done inside the boat (since the weather is yet again WET. I’d love to see a count of exactly how many dry Saturdays there were in 2008!). Last weekend we put up some ghetto double glazing on the Captain’s Cabin windows, as well as the little skylight in the bedroom. You know the stuff – double-sided sticky tape around the rims, cut plastic sheeting to fit, then you get out the hair dryer to shrink it. At £4 it was worth a try anyway, and it does seem to have made a bit of a difference in the draftiness and general cold seepage, and it’s really difficult to tell it’s there unless you’re looking for it. And, finally, last night we relied on the kindness of our neighbours in something akin to an Amish barn raising. Truly we are surrounded by the best people ever. Ok this is getting to be slightly out of date news, but James has been swamped with work so it looks like if I don’t post about it, it’ll get shoved by the wayside… And it’s way too exciting for that! 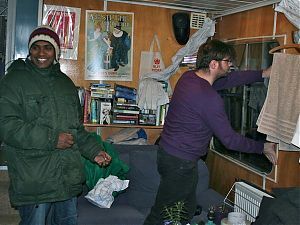 Last Friday James had Nikolaj over to show him how to drain the existing radiator system (which only consisted of 1.5 radiators anyway and exploded upon connection to the new boiler), run an all-new loop of Hep20 piping, and (most excitingly of all!) connect up the big radiator we bought at B&Q last winter! And there she is – the first working radiator to be connected to our fantastically efficient Somy boiler. The saloon is now beautifully warm with it turned on, and thanks to a diesel delivery the same day (600l at 72p/l), we should be all set for fuel through Christmas and beyond… And now James knows exactly what needs to be done to connect more radiators to the system and expand our loop to encompass new rooms – like our bedroom which should be getting underway shortly now that our CAD drawings are very nearly complete (there will be a show & tell here when they are, don’t worry!). It snowed here on Tuesday night. 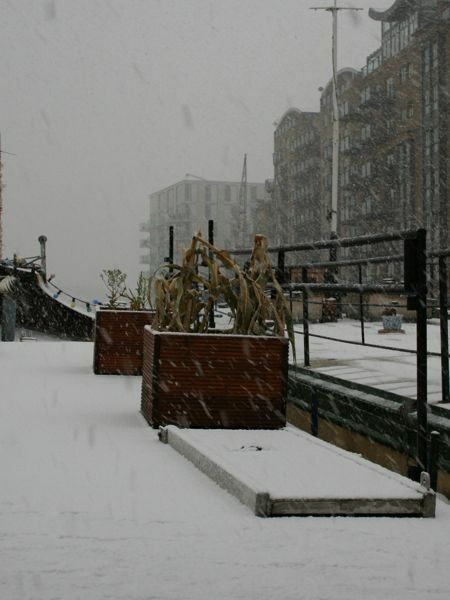 Apparently this is the first October snowfall here in London for over 70 years. Lucky us to get snow in October after two cold, wet “summers” in a row, and a winter that lasted (complete with flurries) through April. Lucky, lucky us. The electric blanket is the best money we’ve ever spent. Yes, this single item has increased our quality of life more than anything else, and it means that we don’t need to turn the heating on until way, way after all our friends have. For £20 you, too, can have blissful nights of sleep. Just don’t think about emerging in the cold morning, okay? 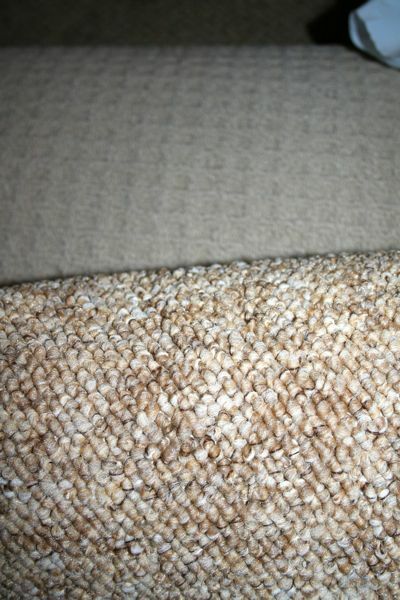 NB: As pointed out to us by our friends who experienced a house fire caused by an electric blanket, these things are very dangerous, and you should treat them with extreme caution as we do – Just like we’d never leave the gas on or an open flame unattended, we also never, ever have the electric blanket on if we’re not right in the room with it! 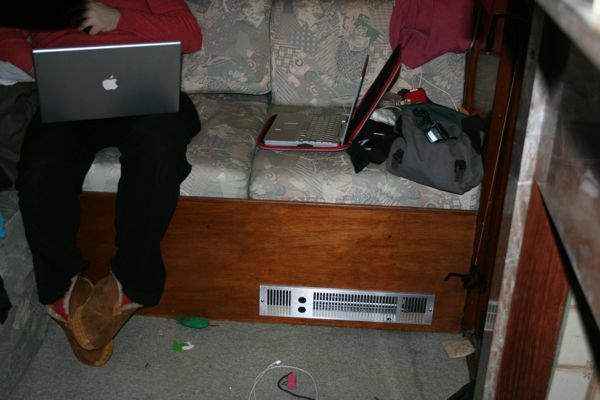 The diesel stove in the captain’s cabin absolutely drinks diesel and is therefore, really expensive to run. When we were running it on low last winter (and “low” is hot enough to almost be too hot back there!) we were going through 200 liters of diesel every 4-6 weeks. By point of comparison, the last 200 liters has lasted us 7 months with just the diesel boiler running. So as much as we love the aesthetics of it back there, it’s fiddly to light, has problems with excessive rain and high winds, and is expensive to boot. So we’re looking for another heating option that won’t disturb the woodwork in the back (so no big ugly radiators!) and, since we’re looking to rent it soon, something that is easy to operate. 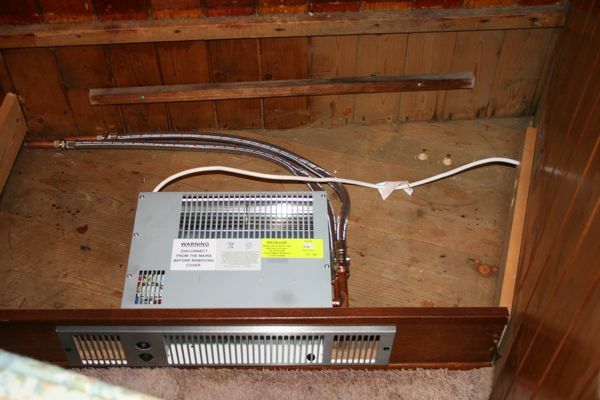 Right now the lead contender is these 12v plinth heaters. They’re low profile, fit into existing cupboards, plumb into our existing boiler like a radiator would, and because these are designed for high moisture areas, the fans are 12v (with a supplied 240v transformer that we just won’t use). The plan now is to put one in the kitchenette area and another in the bedroom, near floor level. Anyone care to poke holes in our plan before we spend £500? The deck outside gets incredibly slippery when frozen, even when it looks matte. Bosco has already slid sideways down the back deck, we came home Tuesday night to find our BBQ table an inch away from being in the river, and I myself slipped and took a high-paced rocket slide down the low tide tilted front deck just last night. What we really need is a week of warmish weather to paint the deck with the grippy stuff, but with the current below-freezing temps, it’d never dry. 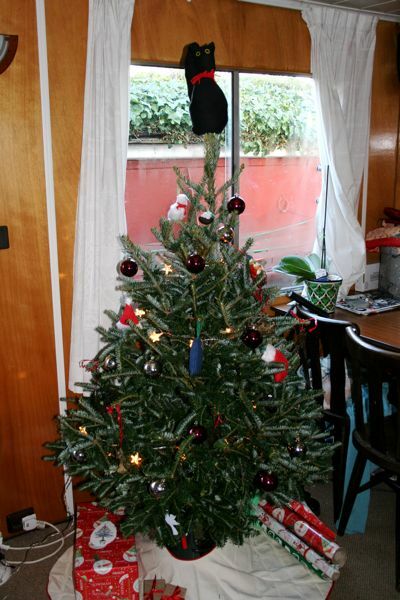 This one’s only got the first coat on, but you get the idea. My earlier mention of the different types of insulation on offer sparked a rather enlightening email debate between a few friends. It started with my friend Brian offering to help me get my head around exactly how vapour barriers work and the various ways you can place it in the Grand Sandwich of hull, walls, and insulation. 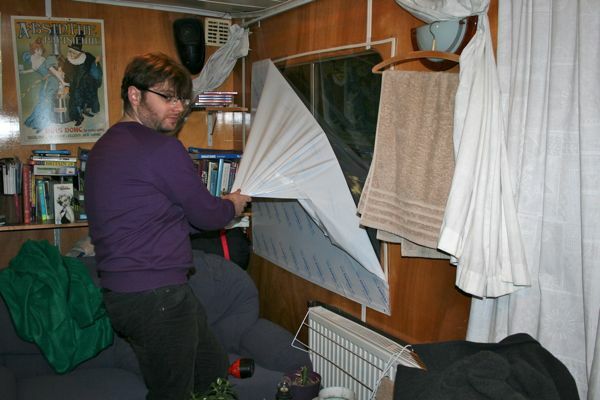 Brian’s got an Architecural Engineering degree (albeit not directly in the study of boat insulation, he was very quick to add!) so he was able to give me some fuzzy principles explained in nice drawings that my brain could understand. what you want – especially as that metal hull is a thermal superhighway between the indoors and out. I then countered that we’re mostly concerned about water vapour from cooking, breathing, heating, etc condensing onto the cold hull and causing mould on the insulation – not a small concern judging from the amount of blacked rockwool we’ve pulled out of the hotel room walls thus far (and those aren’t even the exterior walls yet!). He was then able to draw me some diagrams to help me visualise how the vapour barrier would actually work. looking at microbial growth problems. I was feeling pretty clever, so I passed this over to our friend Steve, whose Luxemotor we just visited last weekend. He then raised a whole new round of questions about insulation I’d never even thought about, and frankly, I had no clue how to answer. At this point I brought out the big guns – I emailed my brother, Steve, who also has an engineering degree, has just completed single-handedly building a massive extension onto his house, and works for the US Navy as a civilian engineer. So he had a bit more recent, practical knowledge and was able to sanity test what Brian had said and fill in a few of boat-owner-Steve’s questions. The vapor barrier is generally simply a sheet of ordinary plastic, and doubles both as a vapor barrier and a draft barrier. 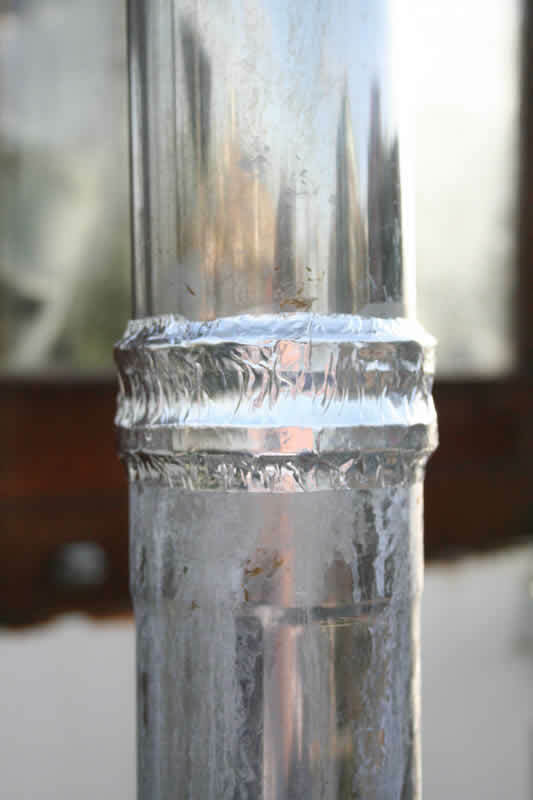 Condensation happens when warm air cools below the dew point, and condensation forms. Rule of thumb is to put the vapor barrier on the warm side. I say “rule of thumb” because the hot and cold side change between summer and winter most places, and half the year, the vapor barrier will be on the wrong side. This is generally OK. What you do not ever ever want to do is put vapor barriers on BOTH sides- one side must be left to breathe. Otherwise any amount of water seeping in will just sit and fester, and water always seems to find a way in. Ok this all makes sense to me. Boat-owner Steve then took what brother-Steve said and actually improved a bit on it, I think. He pointed out that the celotex actually has its own vapour barrier in the foil facing, and to simplify building you could affix the celotex to the back of your interior wall panels, but do it offset a bit to get a tongue and groove effect, preventing any draughts where the wall panels join. US Navy ships simply apply the insulation straight to the bulkhead like in the link below. Usually 1” or 2” glass bat, faced with some sort of fireproof cloth. After it’s painted, it’s pretty vapor impermeable on both sides, but navy doesn’t seem to have much of a problem with it… Honestly, I’d just do it the navy way. Tried and true, right? So we’re still not settled on exactly which type of insulation we’ll be using (though the insulating paint is definitely out and I think we’re less keen on the sprayfoam now), at least we know which order we’ll have to do it in. 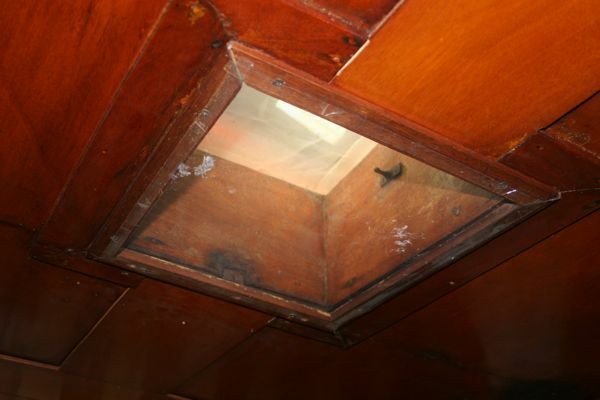 We’ve got some bare hull in the floor of the Captain’s Cabin bedroom to test any of our ideas on, which will hopefully mean we get some of our mistakes out of the way before blowing the time and money on the grand hotel room hold. Anyone have any experience with a certain type of marine insulation they’d like to share? This is very much the time for commenting (not after it’s bought and affixed and you tell us what a bad idea it was! This one was kind of a combination of both. 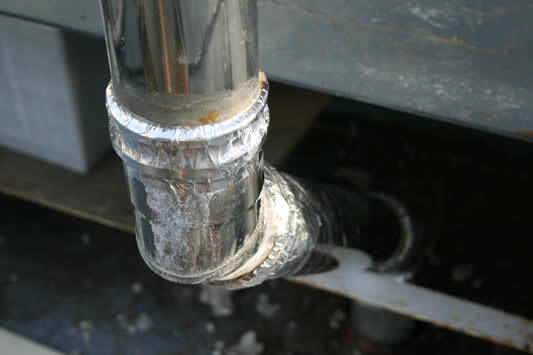 We could see that the fire cement sealing up the joins in the diesel stove flue were cracking and weathering badly – it’s really not meant to be used outside, and it’s so inflexible that walking past the flue could cause it to crack. But it was still a surprise as we were drifting off to sleep one night and the smoke alarm went off. Enough cement had fallen away to open up a hole, and in the high winds last week it was enough to allow a downdraught into the stove and fill the room with smoke. Clearly a better solution was needed. 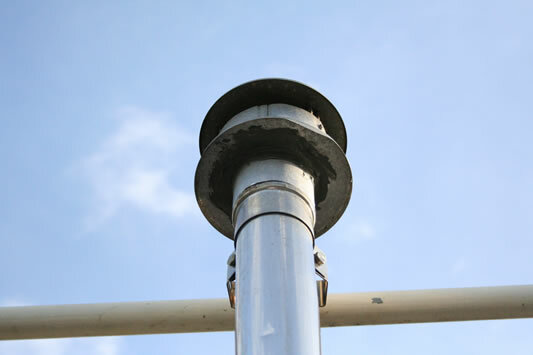 The first job was to swap over the cowl at the top of the flue. When we first put the flue up the only spare cowl we could make fit was one that keeps the water out but isn’t really suitable for diesel stoves. The cowl was considered to be a contributing factor to the downdraught incident so we swapped it for another spare, which had to be made to fit. Nikolaj spotted the best way was to chop down the spare length of slightly larger diameter flue the cowl was already sitting in, so after a few minutes with The Best Toy Ever it was cut to the right dimensions. I also bonded the two bits together using Chemical Metal. That should ensure a freer exhaust and better weather protection. By the way, the chalky stains you can see are from the old cement dissolving in the rain. All in all there were five joints to fix up, but they get progressively harder to access as the flue kinks on its way down and then goes into a cupboard! Finally I gave the innards of the stove a good vacuuming – all the crumbling cement on the inside of the flue ended up down inside the stove and broke up what can only be described as a 1/8” thick biscuit of pure soot off the little insert that manages airflow. She’s been purring away happily ever since. And Bosco still hasn’t learnt not to touch the stove while it’s hot. Even just getting it lit the first time seemed impossible. To even get to that point we had to re-route the flue which came up behind the old wheelhouse – now conveniently placed under a walkway which we nearly cut through but ended up putting a cartoon-style kink in the chimney instead. We had to trace back the old stove’s diesel line only to discover it came up right next to the hot flue – and the batteries! So instead we installed a pump in the engine room (and of course, the pump is 12 volts and our DC system is 24 volts so there’s a bodged-up voltage dropper feeding it) and ran new pipework. Which leaked time and time again and I spent a very frustrating New Year’s Eve trying to replace a foot long stretch of pipe that had kinked. But now the occasional satisfied clonk of the pump indicates that diesel is dripping into the pan. Let me explain how diesel stoves work, in the hope of saving some other diesel neophyte’s arm hair. 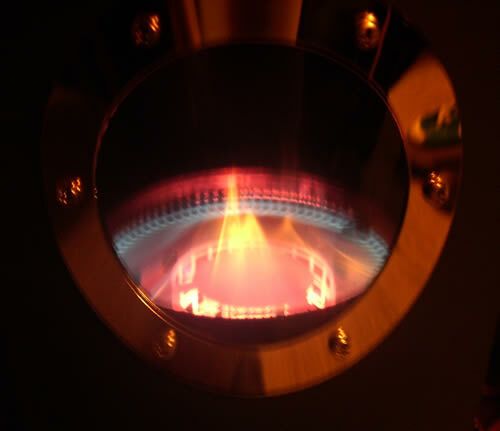 Liquid diesel doesn’t burn so it has to be persuaded to evaporate in a wide pan at the bottom of the stove. To do this you pour in a bit of pure alcohol and light it. The alcohol burns for a minute or two and warms the pan up to the point where the diesel vaporises and starts to burn on its own. After a few more minutes the diesel is keeping everything warm enough and the stove self-sustains. Once the stove is warm enough a temperature probe opens a valve in the regulator to let diesel drip feed into the pan – before this point you have to hold down a lever to bypass the valve and let diesel in at maximum flow. In normal use the stove uses hardly any diesel so this lever can let rather a lot of diesel into the pan before the stove is self-sustaining. Working out how long to hold it down for is an art, not a science. 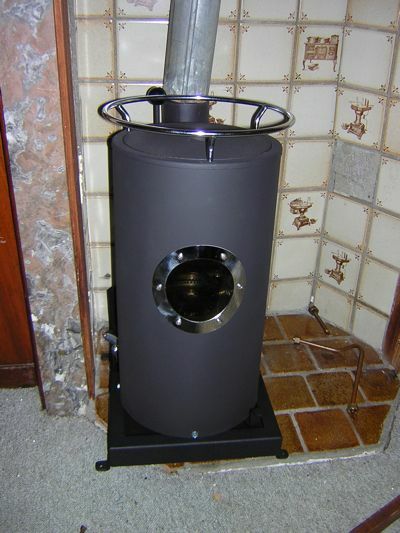 Once the stove is lit, air for the flame is supplied using a tilting hatch at the back with a little counterweight to keep it not too open, not too closed. Too open and too much air gets in, the flame burns bright yellow and deposits soot everywhere. Too little and the diesel can’t burn properly and the stove becomes unsustainable. What you definitely don’t want to do is leave the regulator open and hold the lever down to check for leaks, then try to light the stove with whatever you find in your plumbing kit with a ‘highly flammable’ warning label on it. And you especially don’t want to do all this with the hatch wide open, because the combined effect is to massively overlight the stove, fill the room with smoke and cause a huge roaring cone of flame to threaten to blow the whole thing to smithereens. Instead, soak up any excess diesel with a kitchen towel, use methylated spirit (not white spirit!) and expect to have to turn the stove off, wait for it to cool down, and readjust the hatch several times before the flame burns properly. And expect the cat to act stoned from the smoke. Although the level of camp when we tried to wrap my niece’s Christmas present can’t be attributed to the same. So with the stove keeping us warm (when we remember to keep the diesel tank topped up) the captain’s cabin is feeling quite the cosy home. Except for the old shelf which was exactly at head-cracking height above the sofa. The old owners weren’t exactly beanpoles but surely they must have found it as uncomfortable as we did? A couple of brackets and a few minutes work with my second-favourite toy, the power saw, plus a quick run to B&Q for a spirit level, and we’d saved our skulls and created a Bosco-proof top shelf for precious things. I need to tidy up the edges and varnish where I’ve cut, but finally we can watch telly without causing irreparable curvature of the spine. Ha, I made it sound like we have time to watch telly. Our new diesel stove for the captain’s cabin arrived while we were over alongside the drydock last week, but we were finally able to bring it inside a few days ago when we got our regular access back. It’s a Kabola Old Dutch, and almost identical to the one that was back there before, only it’s a) not a rusting shell, and b) it actually works. It’s also about four times more fuel efficient and has a nice guard rail so our stews don’t slide off, but for all intents and purposes, it’s the same stove. We were hoping this meant we could just reuse the old diesel line and flue from the old stove that are still in the fireplace, but on closer inspection it looks like the old diesel line leads to…. nowhere, and the old flue ends up in an enclosed space under the battery cupboard by the wheelhouse steps. So the previously owners clearly never used that stove at all, which fits into our knowledge of the kanotel being summer-only, and that old stove being reeeeeally old. We were going to rig up a temporary solution with a tiny diesel tank in another cupboard on deck to get the gravity feed, but it turns out that that would be nearly as much work as just making the permanent connection into our main diesel tank in the engine room. 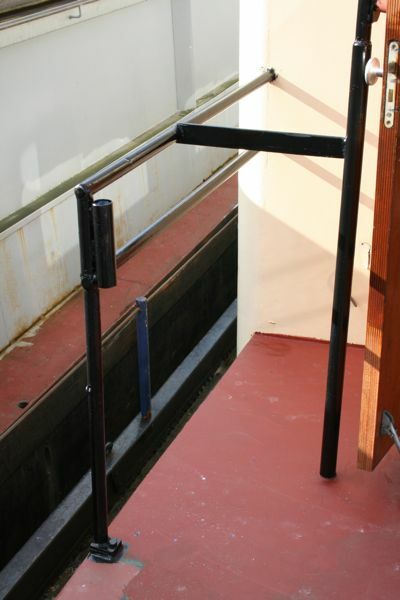 But because the engine room is under the captain’s cabin, we’ll need to buy a £100 fuel pump to counter gravity. And that flue is going to need either two elbow bends or a bit of flexible flue to be able to clear the battery cabinet and vent properly, which is going to be another project. So even though we’ve got our beautiful new stove, there’s still a fair amount of work involved before we can stop suckling at the electric space heater teet and get the captain’s cabin really nice and cozy. You may be asking yourself “Why don’t they just use the massive boiler that was just installed?”. Well, you, that’s a good question. The main reason is that our captain’s cabin is gorgeous and art deco with a lovely marble fireplace and original woodwork and stained glass, and radiators only come in two styles: neo-Victorian, and ultra-modern. Which will be fine for heating the main part of the boat, but would look hideous in the captain’s cabin fireplace. And even if we didn’t care about aesthetics (which we do), it’s be just as much work and expense to plumb in new radiators as it would to get the stove in, and this way we’ve got another layer of backup if something should fail.